This research is an introduction about Islamic banking and finance. It is a close description on how Islamic banks function. In an imaginary world driven by interest and speculations, Islamic banking was a break through in an interest-free system that declines all types of interest, speculation and uncertainty. Research Proposal on Islamic Banking 2. Introduction to Islamic Banking & World Eco History. Finance House (AFH) in Lebanon will be studied. 2 This thesis wouldn‟t come to existence without the direct and indirect help of Dr.
5 friends who constantly encouraged me to accomplish this work. 9 know the direction of my thesis and the direction of my career. support to reach my goal. send her only child to the unknown in pursuit of higher education. To all my brothers and sisters in Islam, I hope you will benefit from this work. 3 1. Growth of the Islamic Banking Industry in Billions of U.S.
Bai al-dayn: Sale of debt or receivables. than that for which one originally sold it. The difference, ostensibly profit, is actually a loan. Fatwa: an authoritative legal opinion based on the Shari‟ah (Islamic law). 15 render most contracts void. 18 collective noun; sometimes an “s” is added to make the plural. 19 Halal: Lawful; one the five major Shari‟ah categorizations of human acts. 20 Haram: Unlawful; one of the five major Shari‟ah categorizations of human acts. 1 Glossary compiled by Miss Maria Khalaf (ESA-Beirut, MeM), using various references such as : Euromoney, Islamic Finance innovation and growth. Mr. Jean-Marc Riegel Islamic finance instruments, ESA 2005, and various Islamic industry‟s literature. 6 Ikhtilaf: Divergence of opinions among jurists. 9 provides either the raw material or cost of manufacturing the goods. 22 Mudarib: The managing partner in a Mudarabah (see above). 9 mark-up over its cost price, this having been specified in the customer‟s promise to purchase. 15 not the extra charge it will receive for deferral of payment. 20 in proportion to the contributed capital. It is not permissible to stipulate otherwise. 2 Prophet Mohammed, peace is upon him. 3 Riba: Interest; sometimes, equated with usury, though its means is somewhat broader. 5 to one on the contracting parties) from a lawful, mutually beneficial exchange and lawful loan. 7 for immediate payment according to specified conditions. 14 the source of law. 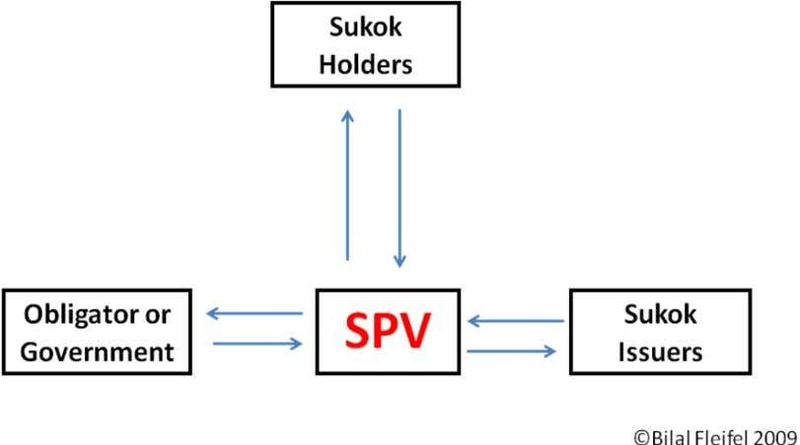 15 Sukuk: Participation securities; coupons, investment certificates. 18 two sources of revelation. 22 investing the insurance contributions. 9 Wadia: Safe-keeping/resale of goods with a discount on the original stated cost. 10 Wakalah: Agency. An agency contract that may include in its terms an agent fee. 11 Zakat: Literally, it means blessing, purification, increase, or cultivation of good deeds. 15 paid from the funds that are subject to Zakat. Figure 1. Growth of the Islamic Banking Industry in Billions of U.S. dollars. 2 For more explanations about Arabic terms check the Glossary at the beginnin of this document. 3 http://www.adherents.com/Religions_By_Adherents.html#Islam. are clearly present (Delorenzo, 2002). This sharing relationship created a performance incentive. Bank 5 in the Capital of Lebanon. 4 BDL stands for Banque du Liban or the Central Bank of Lebanon. For more info check http://www.bdl.gov.lb/. 5 Qatar Islamic bank was established in Qatar and ranks first in the country in assets. For more info check http://www.qib.com.qa/. such as Iran and Sudan transformed their banking system to fully comply with the Shari'ah. and investors to investigate and research this new and unique industry. 7 By current I refer to the credit card crunch and the crisis of 2008 until the issuance of this thesis in summer 2009.
is considered a constitution for Muslims around the world. difficulty to visualize the real equivalent price of one good to another. Africa, the gulf region, and parts of Europe. 8 Sak is the singular word for Sukuk (Islamic bonds). It will be described in details in later parts of this thesis. 9 These kinds of banks were called local saving banks and were established by Dr. Ahmad Najar in Egypt. This experiment lasted three years. a large transition from conventional banks to Islamic banks. 11 Samir Shaer is the head of the Shari‟ah compliance unit at AFH. Check Appendix G for a list of interviews. cannot be foreseen. The main prohibitions in Islam are: Riba, 14 gambling and uncertainty. Islamic laws that affect Muslim individuals are also applicable to Islamic banks. faults of his goods or else the buyer can return the product. higher bid should be taken. Sale should be in an open market. Avoid selling to the deprived or needy but rather donate to them. 15 Refer to the Glossary for more explanations. 16 Refer to the Quran (4,161), (2,275), (2,276), (2,278), and (2,279). 17 Dr. Youssef Al Karadawi is the head of the Muslims council for Islamic scholars and scientist. 18 The Fiqh Council of the Muslim world League, Islamic Fiqh Academy, Organization of the Islamic Conference, The First World Conference of Islamic Economy, and many others said that the interest is the same as Riba. pave the way for Islamic banks to start their operations (Karadawi, 1998). involved to benefit the society as a whole. 19 Mahmoud Ikawi is a famous Islamic scholar in Lebanon. For a list of interviews check Appendix G.
income instead of working and being productive. encouraged because profits and losses will be shared to protect both parties in short and long run. to charity every year. 21 In addition to that, donations are encouraged and rewarded. mainly differs in the conventional banking system that encourages uncertainty and gambling. 20 Check glossary for a detailed explanation. 21 For additional information on Zakat, refer to Appendix D.
22 Branch manager at AFH. For a list of interviews refer to Appendix G.
be affected for a future date. Therefore, all forward and futures contracts are invalid in Shari'ah. Shari‟ah, then it will be possible to use them as hedges against loss in Islamic banks. indicates the desire of Islamic banking to minimize risks and not jeopardize their customers. dealing with the conventional institutions (M. Ikawi, personal communication, May23, 2009). banking are still in their early stages of development. Islamic banks in the private sector. 23 Sabri Ammar is the senior operations manager at AFH. For a list of interviews refer to Appendix G.
system, such as Sudan and Iran. 24 Zamir Iqbal is the Senior Information Officer at the World Bank. living example that banks may and can run without debt. still waiting and monitoring the industry. terms of the effects of the liquidity flow of these funds outside and within. 25 These countries are shown in rank order of most-to-least advanced. 26 The Annual Arab Banking Conference 2006 „Rebuilding Lebanon: Investing in the Future of the Arab World‟. 27 Abed Sino is a business man in UAE and was visiting Lebanon at the time of the interview. in effective demand, increasing production, improving employment, and increasing incomes. Thus, this increases the turnover growth in the national economy. such as Saudi Arabia will build their strategy on profitability and innovation. increase productivity and create more job opportunities. Conventional banks depend on collateral guarantees and non participation in risk. economic welfare of the society. 1. The ownership of the product being held under the contract by the seller. 2. Existence of the subject matter: selling things that do not exist is forbidden unless in the case of Salam or Istisna as discussed later. 3. The subject matter must be specific and described in sufficient details to remove any confusion. The buyer has the right to investigate the product and return it even after the delivery. The price must be specified and the currency must be known. 4. The ability to deliver and the time frame of delivery of the subject matter must be identified. 5. The subject matter must be acceptable by Shari'ah. Selling wine for example will nullify the contract. Wakalah. 28 Other types of contracts such as Ijarah (leasing) or Istisna will be mentioned briefly. Islamic banks were very successful using the Murabahah instrument at the retail level. generated from the service and that in turn creates certain risks. 1. The purchaser determines his or her needs and the specifications of the commodity. 3. Delivery of the commodity. 4. The Murabahah sale contract according to the terms and conditions included in the promise to purchase. 5. The client pays his installments, principal plus the bank‟s profit, as agreed in the promise to purchase contract. lenders are only concerned if the borrower is credit worthy or not. this will reduce losses to the bank in case of buyer bankruptcy. product which may create a more difficult situation on the borrower. bank will act like a normal seller (S. Shaer, personal communication, July 03, 2009). supplier of the client and in the second, the bank will act as the buyer from the actual supplier. the buyer. The bank will be considered as an intermediary between the supplier and the end user. agreement between two parties, the investors on one side and an experienced agent on the other. asset side of the bank. parties in the agreement. The seller will receive the money he needs to deliver the commodity. encouraging price offered by the seller. To protect the buyer from fluctuations in price, a parallel Salam may be created. commodity. It corresponds to the commodity specified in the first Salam contract. Islamic banks are Urboun and Khiyar Al Shart. only difference is that there is no fee paid at the start of this contract. Salam the total payment for goods must be obtained on spot while in Istisna it is upon agreement. The second difference is that in Istisna the product must be manufactured and not harvested. a known price and in return employees will provide them with those skills and qualifications. may rent a seat in UNCW for a known period and will rent it to a student for a deferred price. 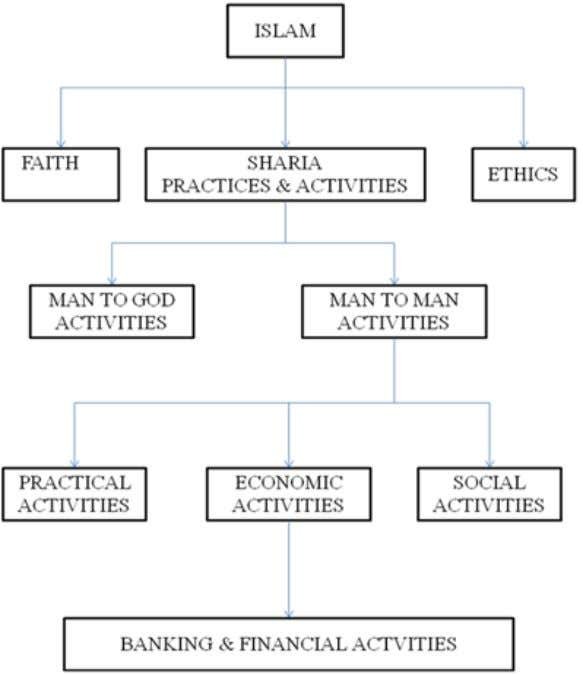 Shari'ah in all their financial and non-financial activities. Islamic banks are required to maintain one more condition, compliance with Shari‟ah. would expose the industry to major reputation and credibility risks. 32 The Islamic Financial Services Board (IFSB) is explained in Appendix D.
of risk and not just receiving return. This is accomplished by getting their clients involved. intermediaries that maintain and assist investors and depositors by becoming a trusted partner. measurement of risks. 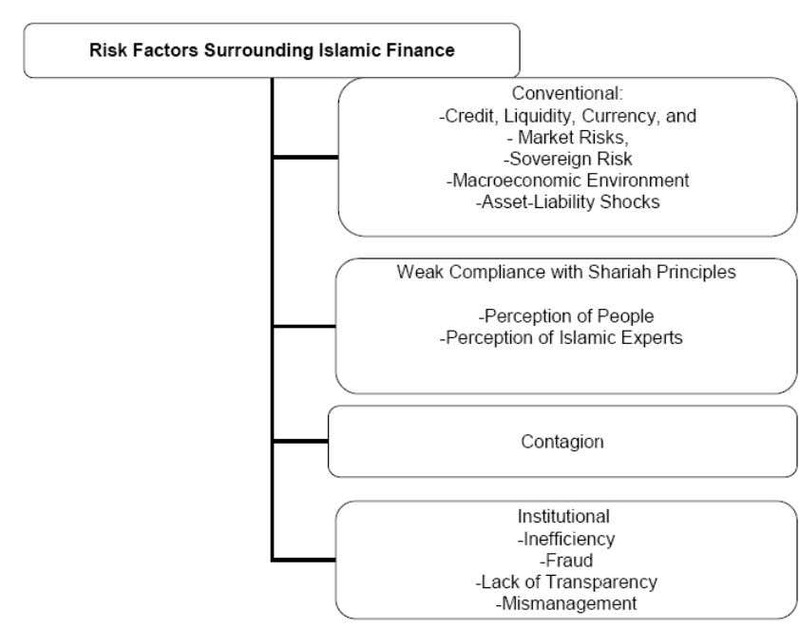 Figure five explains the main risks surrounding Islamic banks. risks, is essential to appreciating the basis upon which Islamic banks operate in their purest form. securing the debt. It is also permissible to have guarantees by third parties. they help in minimizing the withdrawal risk that Islamic banks might face. before deciding on any investment. it might build its reserves in different currencies and stable metals. 33 There is debate between scholars about the prohibition of the conventional insurance because it contains interest. Refer to the Glossary at the end of this thesis for the definition of Takaful. in institutions but also at the individual level. industry development dictated their strategy. about the functionality of Islamic banks. • Specialized training programs for employees. 34 Refer to Appendix D for more details. Credit risks, 2) Market risks, 3) Liquidity risks and 4) Operational risks. obtained without risk,” is a fundamental principle in Islamic law of transactions. between the Islamic legislation and the local law. Independent audits for monitoring the financial and accounting system. Special training programs to monitor the progress of employees. Standardization of measurement tools for risk management purposes. Internal rating systems to maximize and monitor enhancements. The ability to liquidize unpaid obligations from financing instruments. Monitoring business performance and analysis after each increase of debt.  Reporting system to top/senior management for possible or current risks. External sources to help in the risk assessment process. Worst-case scenarios to prepare contingency plans for different situations. Applicability of Takaful to control financial risk. The application of financial engineering to develop synthetic derivatives. 35 Profit Equalization Reserve (PER) and an Investment Risk Reserve (IRR) are internal reserve funds created from stakeholders‟ contributions to back -up the bank in the case of loss or in the case of unexpected returns. 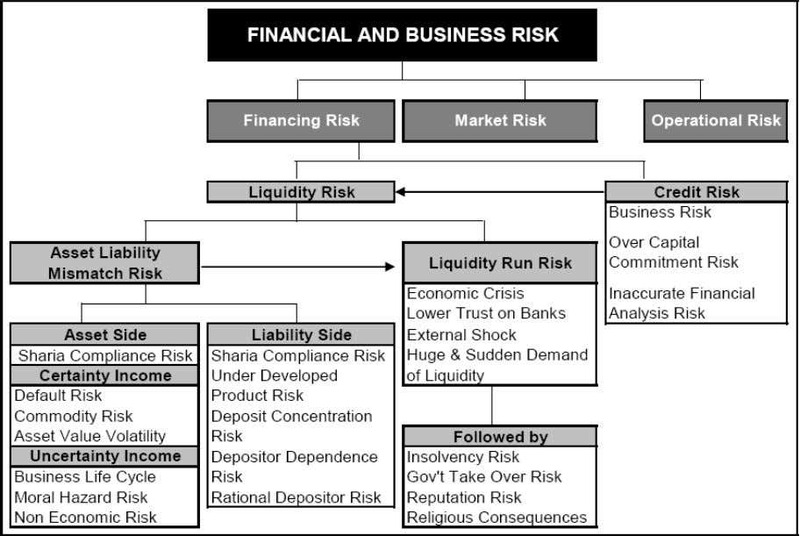 Financing Risks such as liquidity risk and credit risk. Market Risks such as foreign exchange risk, benchmark risk and securities price risk. Operational Risks such as people risk, technological risk and legal risk. that, some of the hedging techniques will be discussed from an Islamic perspective. (c) Non-compliance within the Shari‟ah in various bank activities. institutions makes the threat of obtaining a liquidity risk more likely to happen in Islamic banks. 36 PLS refers to Profit/Loss Sharing. similar to bonds in conventional finance, but they differ in the prohibition of interest. risk in parallel Salam when the first party fails to deliver on time. market risk and commodity risk on the asset side of the balance sheet (Tariqullah, 2007). 37 Dr. Shaer, Mr. Omeich, Mr. Baadarani and others. screening of investments may be done to protect the depositor's money. reporting, and assessing the credit risk exposure taking place under the various Islamic contracts. higher rate or decreasing the term of the contract. maintaining frequent contact with the counterparty. Hiring agencies for the collection of debt. guarantee or to provide personal collaterals. will be distributed equally among them. risk, foreign exchange (FX) risk, as well as price fluctuations in Sukuk and securities price risk. The market risk may also arise from a decrease in the returns of investment accounts (saving). of some of the bank‟s profits, investors, and Takaful companies (Islamic Insurance). 38 Banking book is an accounting book that indicates investments that are not recorded on the balance sheet of the bank. The banking book may refer to the off-balance sheet accounts that are awaiting results. will pay the same in their last month as in the first one. and receive a receipt for this transaction. reserves are in several currencies and are updated on regular basis. 39 The Saudi Riyal is supported by the government of KSA and is considered a fixed currency. Sukuk that contain similar attributes as stocks. facilities, or by the sale of participation certificates that are already held. capability of qualified individuals who are able to perform operations efficiently and effectively. the industry which may lead to reputational risk. encourage them to achieve expertise and qualifications in the Islamic banking industry. reliable system for the various operational needs of the bank. when certain banking laws are negotiated. to determine the mark-up rate. reserve funds are to adjust returns in case of less than expected results. industry or in the conventional banking industry (benchmark risk).  Rumors about the bank in specific and about the industry in general (reputation risk). investments, customer financing, and inter-banking transactions such as commodity Murabahah. The Islamic bank needs those funds to be accessible to honor its contract in any investment. 40 Capital here refers to accounts such as unrestricted accounts, restricted accounts, long -term investments and commodity Murabahah accounts. They believe that they are not exposed to interest rate risk. perceived as immeasurable given the lack of available risk management tools.  Even if hedging tools are available, they are considered to be excessively costly. three months period is fully hedged by the bank. another bank to close the deal and pay the liability with a higher rate – even to another bank. While the debt generated by Islamic banks cannot be sold, it can be used to buy assets. totally accepted by Shari‟ah and minimizes the liquidity risk. contracts, the Urboun and the Khiyar al Shart Sale (put option). the name of a beneficence clause. their abilities to find innovative solutions to the various Shari'ah regulations. acceptable regulatory regime for Islamic financial services. 41 Wasim Al-Aghar is the operations manager at AFH. For list of interviews refer to Appendix G. 42 Lecturer in Economics, Department of Economics, Loughborough University, Loughborough, Leicestershire LE11 3TU, United Kingdom. price of the stock, but he will attain cash and the bank will gain the commission. 44 Refer to the resolutions of the 15 th Islamic Fiqh Council about Tawarroq. 45 Refer to the resolutions of the 17 th Islamic Fiqh Council about Tawarroq. alternatives is by encouraging productivity and sharing on the basis of Profit/Loss Sharing (PLS). irresponsibly might lead to problems not known for the Islamic banking industry. exposes the industry in general to a large reputation risk and eventually causes a systemic risk. Islamic financial products, and performing modifications on them. enhance Islamic-financial products and to create solutions to raised issues. financial tools. An example for that would be the commodity Murabahah discussed later. certificates. Sukuk are an excellent solution to raise money for funding projects and investments. tangible assets. Sukuk are directly linked with real sector activities. the various types of investments to raise money. operations with full transparency and efficiency (Maroun, 2002). Mudarabah buys a commodity such as gold or crude oil and pays on spot for the entire amount. expand options of investors who wish to use their money in a Shari‟ah-compliant manner. publicity, state support, and societal support (B. Khatib, personal communication, July 16, 2009). 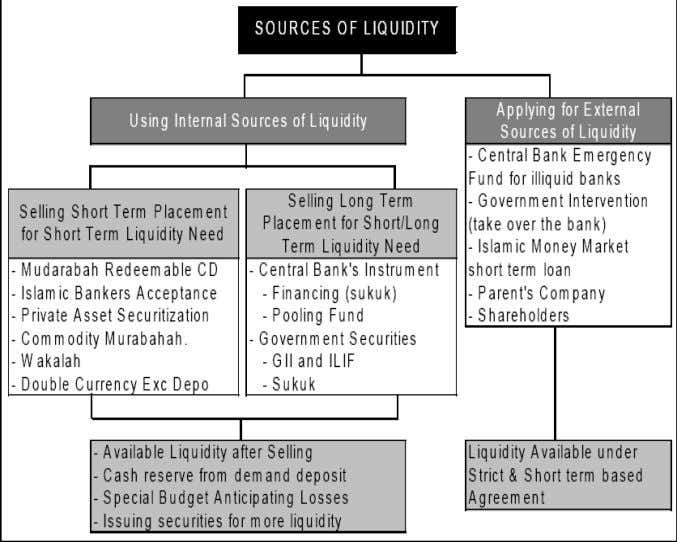 46 For more info about other type of Sukuk refer to “Liquidity Management and Trade Financing. In Islamic Finance Growth and Innovation” (Maroun 2002). 47 Mixed environment refers to the existence of both Islamic and conventional banks. 48 The three primary PLS instruments are Murabahah, Mudarabah, and Musharakah. addition to that, investors must obtain various studies on the project to visualize the outcomes. larger portion of the society because of the concept of the Profit/Loss System (PLS). 49 Abdul Kader Thomas is the President and CEO of Shape Financial, a consulting and training group in Kuwait and USA. employees from existing Islamic banks in Lebanon such as the Baraka Bank. 50 The term „donates‟ means to give without any return. This type of donation is called “hiba” or a gift. 51 IFQ refers to Islamic Finance Qualification and it aims to explain the industry in a detailed approach. AFH require all employees to obtain this qualification. binding power to implement and impose its standards and regulations on banks. the Shari'ah board that complies with Law No 575.
tremendous challenges, primarily its need to be fully integrated in the global financial system. the central bank on a Murabahah basis and then sell this commodity for a third party on spot. Islamic banks in the country under the supervision of regulatory institutions or the central bank. This reserve provides those banks with interest-free loans (Qard Hasan). 52 Vice President of the Central Bank of Lebanon. 53 Dr. Ahmad Jachi’s speech, delivered at the 3rd Islamic Financial Services Board Summit held in Beirut on 16-18 May, 2006.
banks must donate this money to charity or to other channels without benefiting from them. and sell the commodity on the basis of Murabahah which generates profit instead of interest. regular meetings before imposing new laws. Are Islamic banks really Islamic? There is an argument between Scholars as to whether Islamic banking is really Islamic. a way that will generate a fixed rate of return. the method of Islamic profit on the basis of the current interest-rate benchmark, usually LIBOR. instruments which are largely questioned by the Shari‟ah. July 03, 2009). From a conservative society the message was clearly delivered. to be able to perform the various tasks. more focused and determined to adapt. 54 Refer to Appendix A.
of 15 percent of total deposits held at the central bank. 55 Ghassan Chammas is a professor at the Lebanese American University and has conducted significant research about Islamic banking and finance.